The Economist – THE debate in rich countries about the high price of drugs is a furious and frustrating one. The controversy is already having an impact on spending on drugs, suggest new figures from the QuintilesIMS Institute, a research firm. The rate of growth in spending on prescription medicines in America fell to 4.8% in 2016, less than half the average rate of the previous two years (after adjusting for discounts and rebates). Michael Levesque of Moody’s, a rating agency, reckons that pressure over pricing is contributing to a deceleration in earnings growth at pharma firms. Public scrutiny constrains their flexibility over what they can charge and allows payers to get tougher. In one area, however, earnings are expected to keep rising: cancer. Oncology is the industry’s bright spot, says Mr Levesque. The grim fact is that two-fifths of people can now expect to get cancer in their lifetime because of rising longevity. This is one of the reasons why the number of new cancer drugs has expanded by more than 60% over the past decade. The late-phase pipeline of new medicines contains more than 600 cancer treatments. New cancer drugs are being approved more quickly. More are arriving all the time. On May 1st, America’s Food and Drug Administration approved durvalumab (trademarked Imfinzi), a drug from AstraZeneca, a British firm, which treats cancer of the bladder. Imfinzi, which has a wholesale price of $180,000 for treatment lasting a year, joins a growing crowd of medicines known as “checkpoint inhibitors”, designed to work on a key molecular target that helps the body’s own immune system to fight cancer. Merck of America has pembrolizumab (Keytruda); Bristol-Myers Squibb has nivolumab (Opdivo); and Switzerland’s Roche has atezolizumab (Tecentriq). These checkpoint inhibitors are expected to account for much of the growth in spending on cancer medicines. Merck, in particular, has done well with Keytruda. A sense of the value of the new drugs came when Opdivo failed a key clinical trial in August last year. The market value of Bristol-Myers Squibb fell by 16%, and its shares have been in the doldrums since. Handsome prices for cancer drugs are far less pleasing for governments, insurers and patients. Even five years ago, most newly-approved treatments had gross annual prices of more than $100,000. But the pressure on budgets has worsened with the new generation of more expensive immuno-oncology drugs, and could become more severe still if they are found to work best in combination with each other. 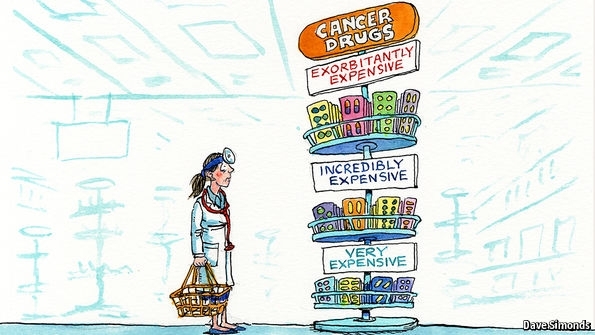 Making a mistake over which cancer drugs to use can be extremely costly for a payer, as illustrated by a disastrous recent attempt by Britain’s government to increase access to new cancer drugs by creating a special fund in 2010. By the time it closed in 2016, £1.27bn ($1.83bn) had been spent, mostly on drugs that were later shown to be ineffective for the conditions they were tried on. Some think a better approach would be to try drugs out on patients and for payers to pay a price based on how well they work, an approach known as “value-based pricing”. That would mean collecting a great deal of data from patients, which would be far from straightforward. Some companies, such as Genentech, a biotech company owned by Roche, are trying to do just this, as are some payers including American health insurers. But however reassuring it is to know that money is going on drugs that are proven to work, it does not solve the broader problem of affordability. Publicação muito interessante! Além da maior longevidade, fator apontado na notícia, outro elemento que tende a encarecer os medicamentos é a maior especificidade dos cânceres. Com o avanço da medicina, os cânceres tendem a ser cada vez mais subdivididos, e também mais raros, assim como as drogas para combatê-los. O câncer de pulmão por exemplo, hoje já possui uma grande diversidade de tipos (ou subtipos), que podem ter tratamentos diversos. Os medicamentos desenvolvidos, consequentemente, atendem uma demanda muito menor, o que torna seu preço extremamente alto. Tudo isso faz com que a incorporação desses medicamentos no SUS seja quase impossível, já que a análise feita no processo de incorporação baseia-se no levantamento do custo e efetividade do tratamento. Uma droga de alto custo destinada a poucos pacientes dificilmente atende a critérios de custo-efetividade. Isso faz com que esses pacientes fiquem desassistidos e também eleva a judicialização da saúde, uma vez que esses medicamentos são buscados pela via judicial. É necessário que a política pública acompanhe o avanço da medicina, elaborando mecanismos de negociação que permitam a dispensação de medicamentos de alto custo no sistema público.